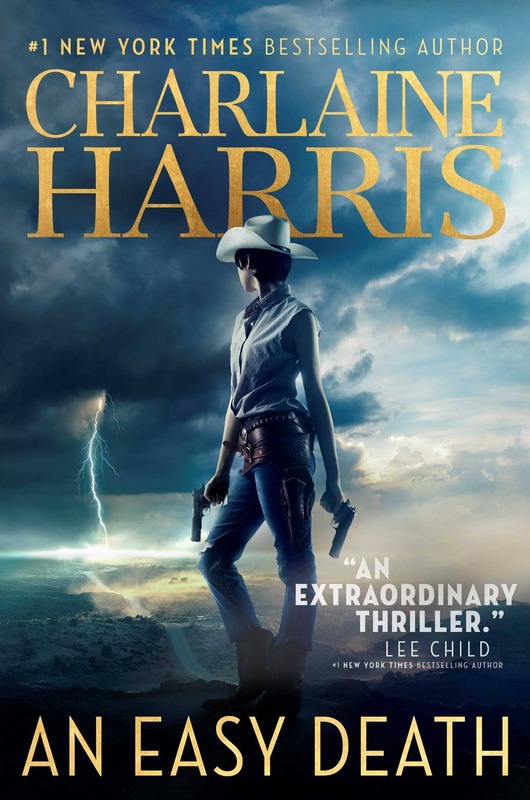 Charlaine Harris was the first really big interview we ever scored at Black Gate. This was thirteen years ago, before the breakout success of the True Blood HBO series based on her Sookie Stackhouse novels, but she was already hugely popular. Goth Chick met with her at a restaurant, before a big signing event here in the suburbs of Chicago, and came back totally charmed. We included the interview in Black Gate 8, the Summer 2005 issue, and it was a big hit with readers. Harris has reached a point in her career where she can do whatever she wants. 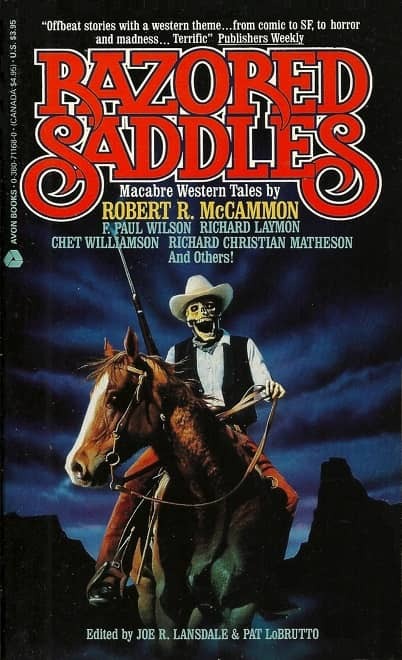 Fortunately for us, what she wants to do appears to be tell Weird Western tales. 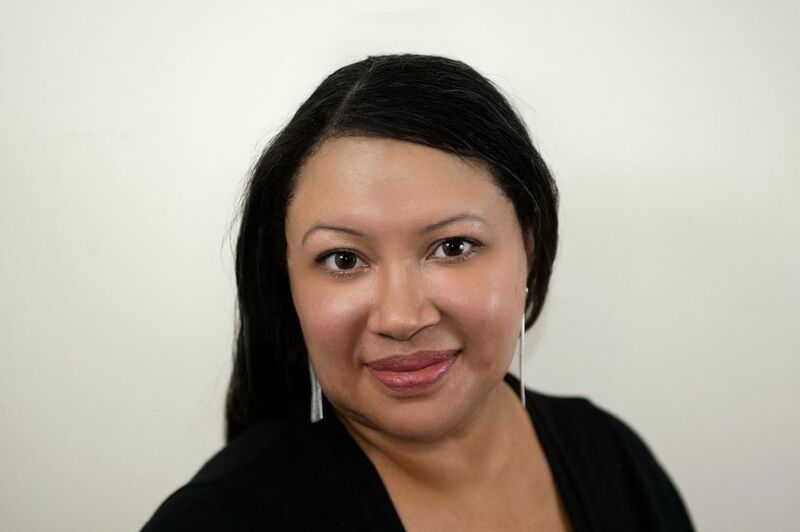 Her latest, An Easy Death, is set in a southwestern country known as Texoma, where magic is common and a young gunslinger named Lizbeth Rose takes a job to be a local guide for a pair of Russian wizards. 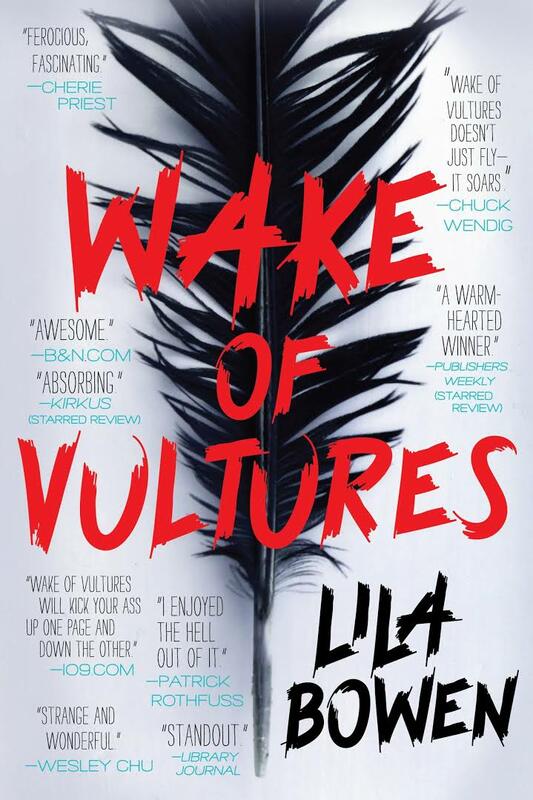 But all is not what it appears to be, and dark forces are aligning against Lizbeth and her clients. 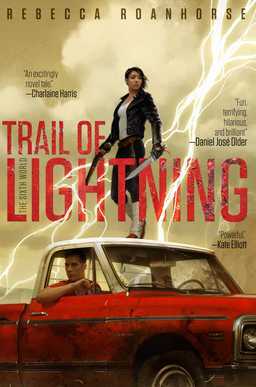 It was published in hardcover earlier this month by Saga Press. 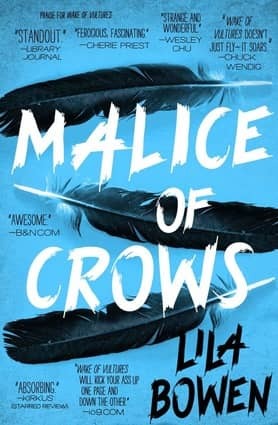 The beloved #1 New York Times bestselling author of the Sookie Stackhouse series, the inspiration for HBO’s True Blood, and the Midnight Crossroad trilogy adapted for NBC’s Midnight, Texas, has written a taut new thriller — the first in the Gunnie Rose series — centered on a young gunslinging mercenary, Lizbeth Rose. An Easy Death was published by Saga Press on October 2, 2018. It is 306 pages, priced at $26.99 in hardcover and $7.99 for the digital edition. The cover is by Colin Anderson. Read the complete first chapter here. If you’re a Weird Western fan like me, you know some years are a lot leaner than others. Like pioneers on the prairie, you learn to survive by keeping your eyes sharp for unexpected bounty. 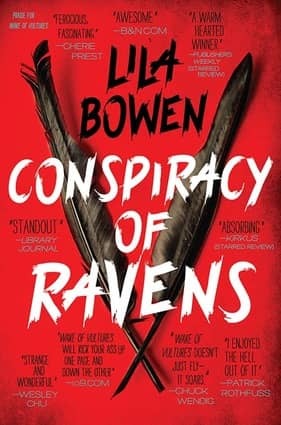 So I have no idea how Lila Bowen’s The Shadow series managed to evade me this long. I stumbled on a remaindered copy of the second book over at Bookoutlet, and quickly tracked down the other two volumes. And I just learned today that the fourth and final book, Treason of Hawks, arrives on Tuesday — perfect timing. In a featured review last year at Tor.com, Alex Brown offered a tantalizing summary of the story so far. Here’s his take. 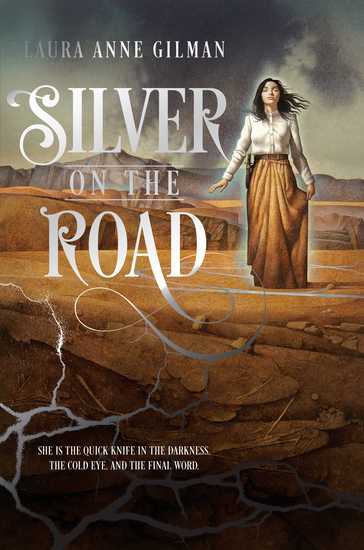 Gilman… [has] chosen a fertile place to begin her new series (the broad plains, red rock and looming mountains of the American West), and amped up the oddity of it all by planting the Devil there as a card dealer, fancy-pants and owner of a saloon in a town called Flood. And the Devil, he runs the Territory. Owns it in a way. Wards it against things meaner than he is, because Gilman’s Devil isn’t exactly the church-y version. He’s dapper in a fine suit and starched shirt. He’s power incarnate — a man (no horns, no forked tail, just a hint of brimstone now and then) who gets things done; who offers bargains to any who come asking and always keeps to the terms because, as everyone in the territory knows, “The Devil runs an honest house.” He never asks for anything you’re not prepared to give, never gives anything that doesn’t have a price. 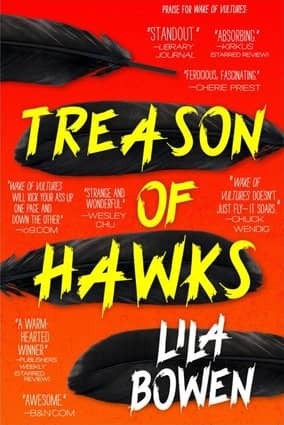 So when Isobel, who has worked since childhood as an indenture in the Devil’s house, comes of age and has the chance to cut her own deal with Old Scratch, she gives the only thing she owns — herself — into the employ of the Boss and becomes the Devil’s Left Hand. 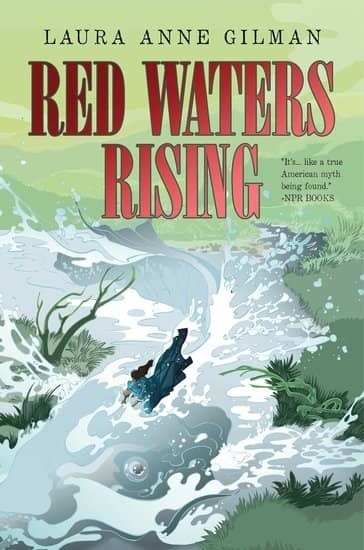 The third and final volume, Red Waters Rising, finally arrived in June, and our friend John DeNardo at Kirkus Reviews called it “a gripping conclusion.” It’s been too long since I’ve had a great Weird Western to dig into, and finally having all three books on my shelf has proven irresistible. They will be my pleasure reading this weekend. One of the many things I love about the Call of Cthulhu RPG — besides the prospect of gathering with close friends to cheerfully go insane together — is the rich array of settings. 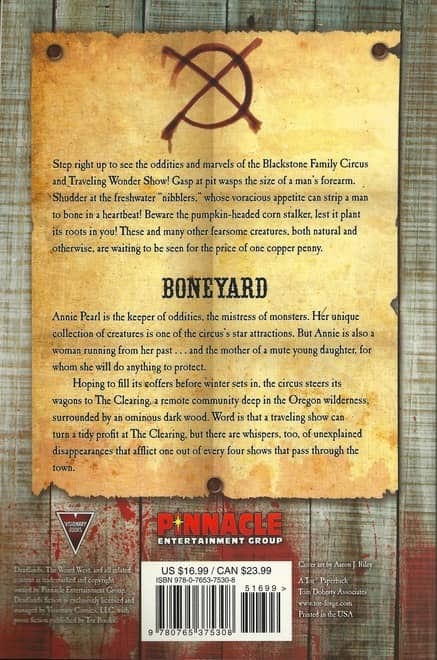 The core game is set in 1930s America, where Lovecraft (who died in 1937) set virtually all of his fiction, and that serves the pulp horror aesthetic nicely. But over the years Chaosium, and other publishers, have produced several top-notch supplements giving players the option to adventure in a wide range of times and places. These include Cthulhu Now (1987), Terror Australis (1987), King of Chicago (1992), The Cairo Guidebook (1995), Atomic-Age Cthulhu (2013), and many, many more. 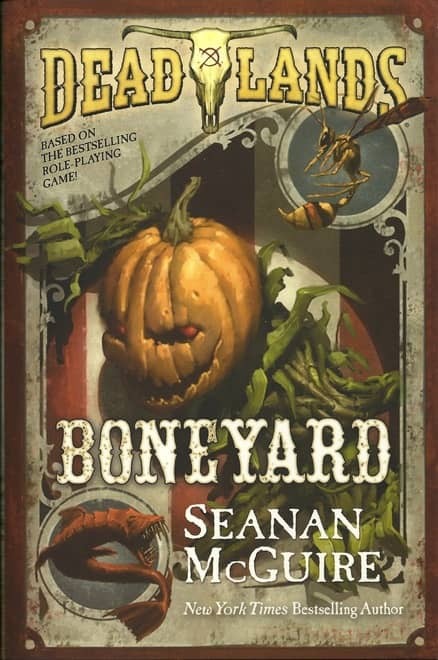 The Dreamlands, Victorian London, Scotland, even the Orient Express… no other game invites you to go stark, raving mad in such finely detailed surroundings. However, CoC has been sorely lacking a weird western sourcebook, so I was very pleased to see Kevin Ross and his friends at Chaosium release Down Darker Trails, a massive full-color 256-page hardcover which lovingly brings Mythos horror to the old west. 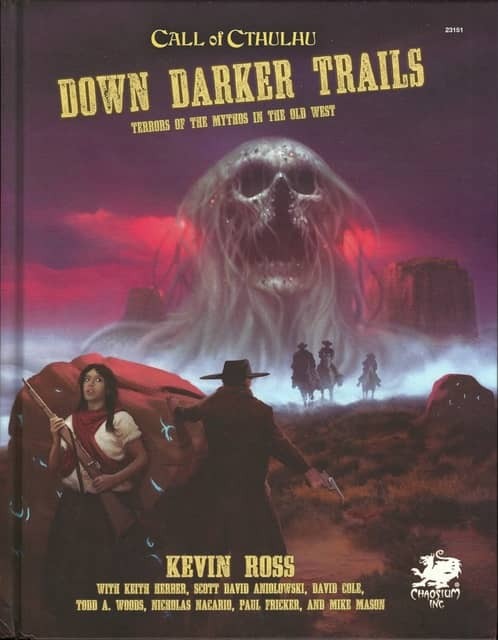 The book is an excellent addition to Chaosium’s catalog, and contains a splendid historical re-telling of the American Territories, plenty of famous individuals, two complete towns, four western-themed Lost Worlds (including the weird subterranean world of K’n-yan, and the eerie Shadow Desert), and two complete introductory adventures. Down Darker Trails invites you to play American Indian heroes and famous gunslingers, visit famous sites, and discover just how deeply the terror and mystery of the Great Old Ones has seeped into the West. 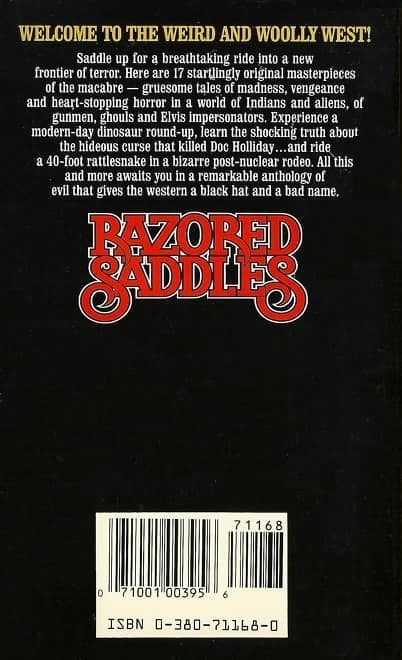 Razored Saddles is the first Weird Western anthology I can recall. It was published as a limited edition hardcover from Dark Harvest in September 1989; I don’t usually buy limited edition hardcovers, but for this I made an exception. I wasn’t even aware there was a paperback edition until I came across a copy five years ago at the Windy City Pulp and Paper Show. I loved the spooky new Avon cover by Lee MacLeod, but that copy was priced at $25 — more than I paid for the hardcover! I’m pretty good at tracking down paperbacks though, and now that I knew it existed, I figured I could find one at a reasonable price. And sure enough, I did, although it took longer than I expected. With the help of an eBay Saved Search, I finally found the unread copy above in March… priced at $7, less than a brand new paperback. 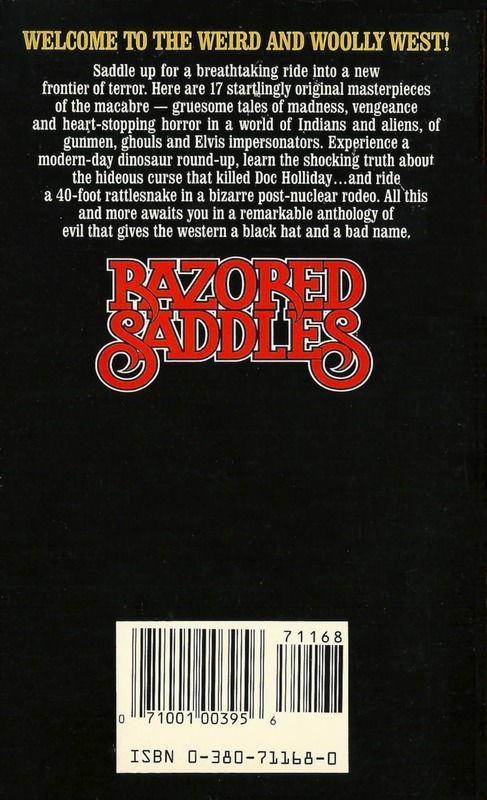 Razored Saddles had two co-editors. 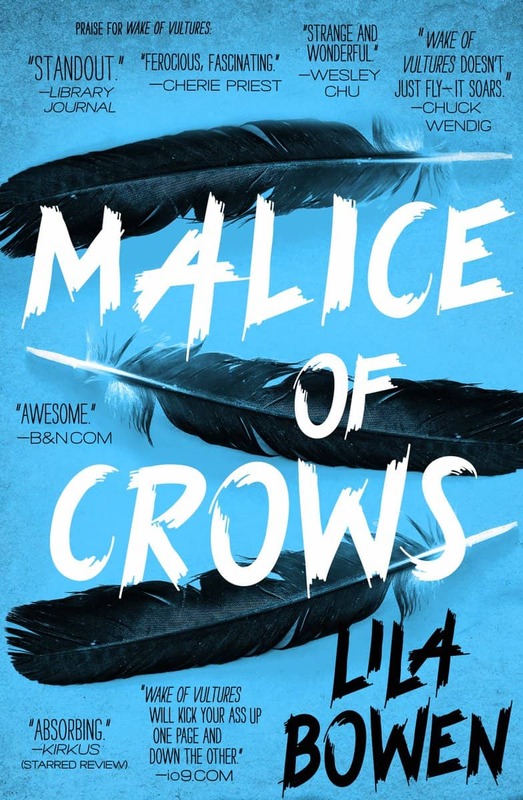 Joe R. Lansdale needs no introduction; these days he’s best known as the author of the Hap and Leonard series, crime novels made into the highly regarded series on SundanceTV. 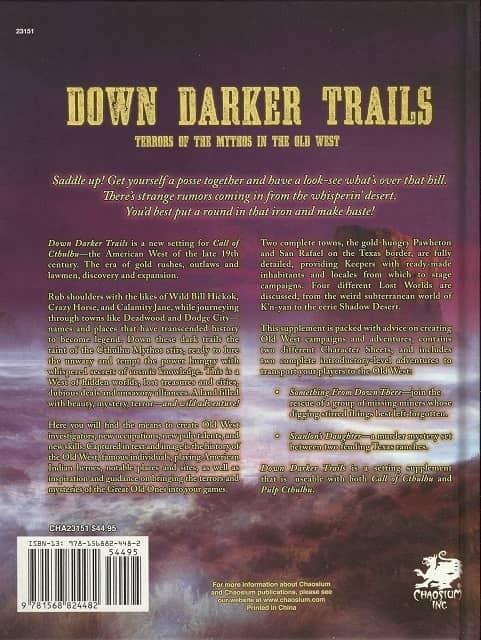 But he’s also the author of over 50 novels and 26 collections, including The Nightrunners (1987), By Bizarre Hands (1989), and The Bottoms (2000). He has won ten Bram Stoker Awards. Pat LoBrutto began working with a summer job in the mailroom of Ace Books, and soon graduated to editing the US editions of Perry Rhodan with Forrest J. Ackerman in 1974. He won the World Fantasy Award for editing in 1986, and co-edited Full Spectrum 2 (1989). He is currently an acquiring editor for Tor Books. Well I have good news for Liz: the sequel has arrived. 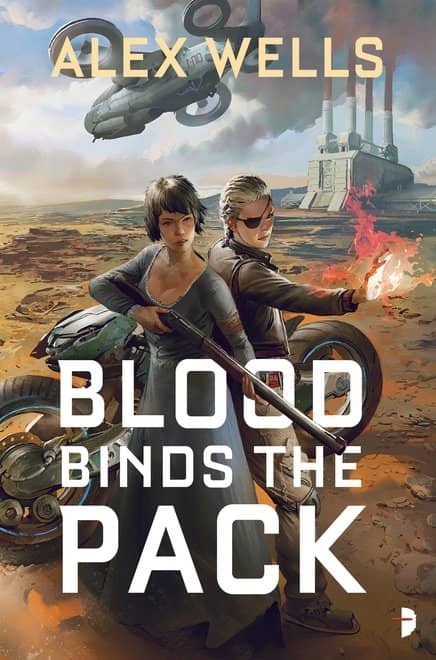 Blood Binds the Pack was released last week, it sounds as engaging as the first, and I ordered a copy as soon as it was available. Here’s the description. War is coming to Hob Ravani’s world. The company that holds it in monopoly, TransRift Inc, has at last found what they’re looking for — the source of the power that enables their Weathermen to rip holes in space and time, allowing the interstellar travel all of human society now takes for granted. And they will mine every last grain of it from Tanegawa’s World no matter the cost. 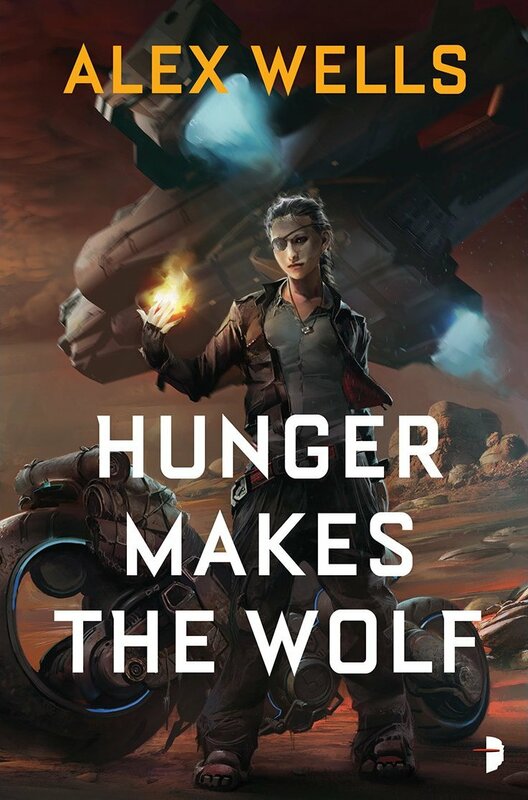 Since Hob Ravani used her witchy powers to pull a massive train job and destroy TransRift Inc’s control on this part of the planet, the Ghost Wolves aren’t just outlaws, they’re the resistance. Mag’s miner collective grows restless as TransRift pushes them ever harder to strip the world of its strange, blue mineral. Now Shige Rollins has returned with a new charge — Mr Yellow, the most advanced model of Weatherman, infused with the recovered mineral samples and made into something stranger, stronger, and deadlier than before. And Mr Yellow is very, very hungry. Blood Binds the Pack was published by Angry Robot on February 6, 2018. It is 496 pages, priced at $8.99 in paperback and $6.99 for the digital edition. 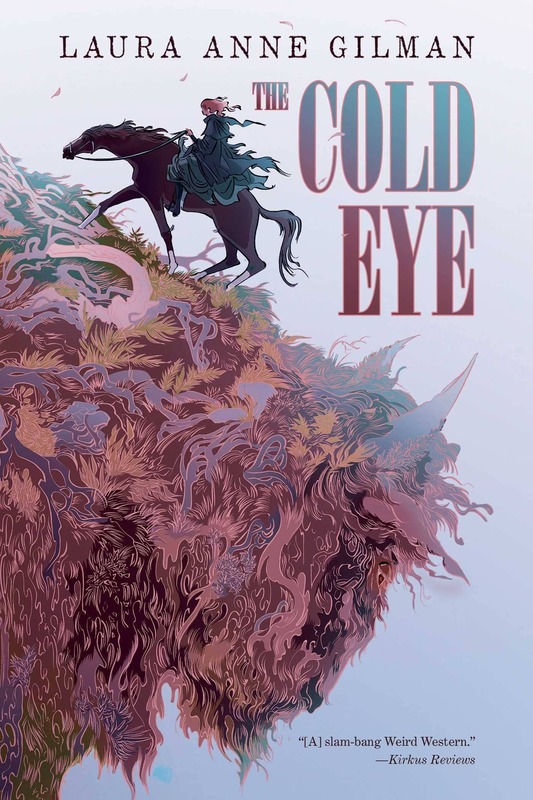 The cover is by Ignacio Lazcano. Read the first two chapters here. 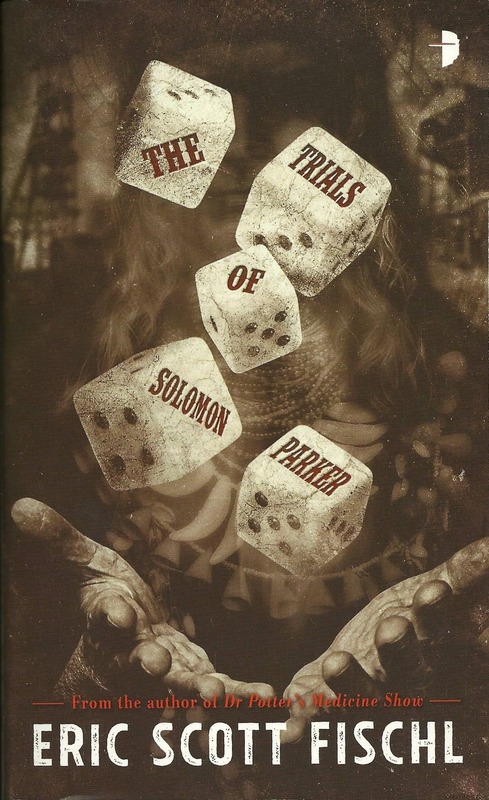 The Trials of Solomon Parker doesn’t look it, but it’s part of a series. A loose series maybe, but still a series. The first novel, Dr Potter’s Medicine Show, was published by Angry Robot back in March. At least you don’t have to wait long between installments. 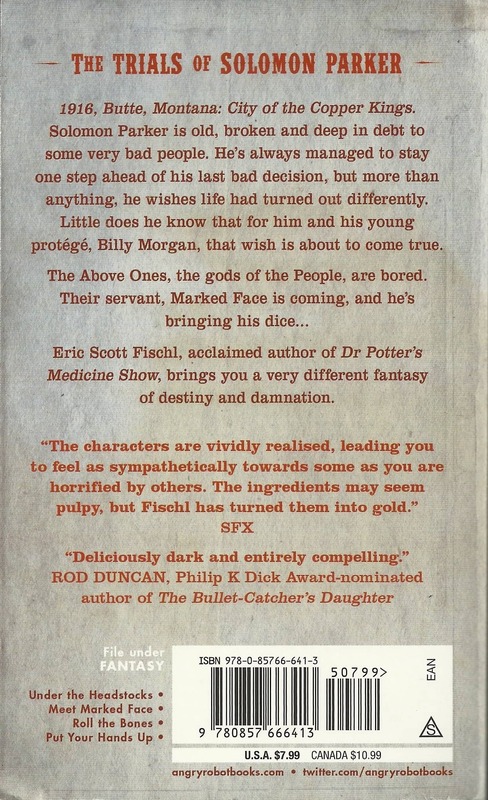 An Enthusiastic Carnival of Horrors… even though Dr. Potter rightly belongs on the “horror/occult” side of the Weird Western spectrum, it cleaves apart from the sensational grimdark vogue that so heavily tints our view of the past. Fischl’s command of his characters’ world is grotesque, vivid, joyful, and sublime — an uncommon realism that honors the human side of history, and a reminder that a carnival of horrors is still a carnival, after all, with miracles and spectacles awaiting anyone brave enough to venture into the sideshow tent. The Trials of Solomon Parker was published by Angry Robot on October 3, 2017. It is 384 pages, priced at $7.99 in paperback and $6.99 for the digital edition. The cover is by Steven Meyer-Rassow. But whatever the reason, I’m glad to have it. It went right to the top of my Halloween reading pile this year. GigaNotoSaurus got my attention back in July with Daniel Ausema’s long Sword & Sorcery novelette “The Poetics of Defiance.” Here’s what Ausema said about the story at his website, Twigs and Brambles. “The Poetics of Defiance” is one of the longer stories I’ve had published. It’s a fun one that I’m very proud of. It started with an idea to come up with the two most unlikely jobs for a traditional sword & sorcery story, and I came up with an alchemist (I’ve liked the idea of a traveling alchemist ever since I was into D&D back in high school) and a poet. It ended up straying from the S&S idea somewhat… I had a lot of fun with creating the snippets of poetry for the attack poet. This month GigaNotoSaurus features a brand new 15,507-word Weird Western by L.S. 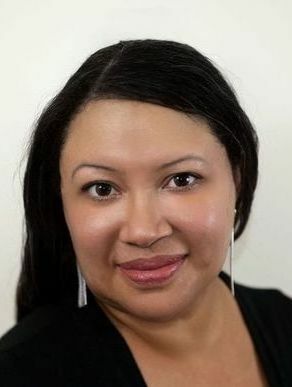 Johnson, “To Us May Grace Be Given.” Here’s Charles Payseur at Quick Sip Reviews. Read the story free here, and read Charles’ complete review here.